Professional Washing & Auto Scrubbing By The Best in Houston, TX! Can’t Get Rid Of That Stain? That’s what we’re here for! Count on us for professional washing and auto scrubbing services! Professional floor cleaning is not just vacuuming or sweeping dust. Most of the times it involves removing persistent stains and residues and sometimes sanitizing contamination such as bacteria and mold. Therefore, our technicians' equipment includes heavy duty machinery, to allow them to overcome any challenge that may come their way. That's how we leave every client satisfied after providing high-quality work. Here's an example of such equipment and how it serves our technicians at Duct & Attic Cleaning Experts, Huston. Some stains prove more difficult to remove than others. Sometimes, taking care of such stains and residues can only be done by applying high pressure water directly at the spot or area that needs to be cleaned. In times past, that high pressure had to be applied by hand, scrubbing the place over and over again until it was finally removed, which not always produced successful results. These days, technology has significantly advanced and allows applying much more pressure with much less effort. Now, there are mechanical and electric machines that release focused, high pressure jets of water of varying levels of pressure. When such powerful jets are directed at the spot we wish to clean, stains stand little chance of triumph. Another type of machinery are the auto scrubbers which are used to automatically scrub areas of the floor to clean them from debris, grease, or anything else that needs cleaning. • Fireplace and chimney cleaning – the high pressure can help remove the soot off the fireplace and chimney. • Exhaust hood cleaning – after applying warm water, our technicians use pressure washing to remove the grease off the exhaust system. 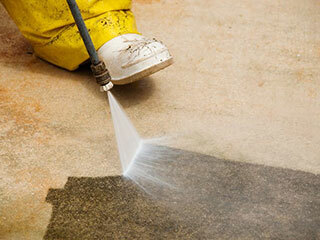 • Carpet cleaning – both pressure washing and auto scrubbing are used in the process of cleaning carpets. • Upholstery cleaning – both pressure washing and auto scrubbing will allow our technicians to restore your furniture upholstery's good looks. • Tile and grout cleaning – these means enable us to clean tiles, floors and grouts. You could use our services? Contact us and we will be happy to offer you the best solution to your situation anywhere in Houston TX!